Malaysia’s friendly traditional communities have opened up their homes to foreign guests so they can have a taste of the ‘kampung’ or village lifestyle to cherish for a lifetime. Experiencing a homestay in a traditional village is perhaps one of the fastest and easiest ways to get to know the real tribes of Malaysia. You will discover that things here move at a slightly slower pace than in the city, and for those who relish the quiet calm of the rustic life, this is possibly as good as it gets. Peraya Homestay opened its doors in 2006 and since then has established a reputation for its integrity in the marketplace. Our commitment to the principles of conservation and our work with local communities have been acknowledged internationally and well received by our many clients. “We are dedicated to providing our clients with ethical tourism products that are sustainable. Presently, we operate mainly in the Malaysian states of Sarawak. Our main concern is for the safety of our clients. 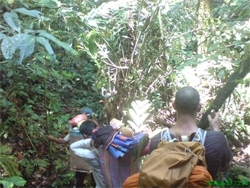 Our guides have between them a wide and formidable knowledge of the local culture, rainforest and wildlife. We can provide the service of specialists for those who want to have even greater in-depth information on Borneo. 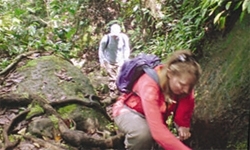 The vast and cumulative experience of our staff ensure that your adventure in Borneo is unforgettable. Peraya Homestay is dedicated to providing our clients with ethical tourism products which are sustainable. Tour Commences: from Pearaya Homestay Room Type The accommodation, family house type, Bamboo hut type and camping for survival tours. Room Description: Accommodation, catering for about 6 people, is own by Bidayuh family style. Mattresses, pillows, and blankets are provided. Toilets and showers are adjacent to the accommodation. There are also hand basins. Facility & Activity: The hostess is particularly noted for his capabilities in jungle life., and it is worth staying to experience the real jungle’s can provider’s in our life’s. Things to Bring Checklist Attire ~ Light cotton long sleeve and short sleeve t-shirts , shorts and long pants (Whites, grey, browns and earthy coloured clothing to blend into the jungle), swimwear, underwear, long socks, raincoat or poncho, one pair of sandals or flip flops (the cheapest you can buy) for easy walking ; one pair of shoes with good grip(trainers for jogging, tennis, sporty types) for jungle treks . Do not wear tevas or open sandals for trekking (but this is good if you’re thinking of rafting. This will expose you to leech attacks especially on ground level. Creature Comforts ~ towel, toilet paper, soap / facial wash, shampoo, toothbrush / toothpaste, comb, reading material. Essentials to get you through ~ personal medication, mosquito repellent, sun block lotion, heat rub for muscles ache , flashlights , ear plugs or cotton balls (for those who can sleep with the TV blasting and not when its sound of nature that punctuates the night’s silence), water bottle, minimum 2 liters capacity. Nice to haves ~ camera and batteries , video cameras, bird book, binoculars. Survival Kit ~ compass, anti-histamine ointment or pills, rubber bands, sewing kit, plaster, gauze, cotton wool, 1. Carry at least 3 ways to start a fire – Vaseline soaked cotton balls, magnifying glass and cigarette lighter. 2. A small bottle of iodine to disinfect water. Use 1 small drop for every litre. 3. A few zip lock bags for holding water.4. Dental floss (100m). It’s a light and tough string with many uses. 5. Mini flashlight. 6. Heavy duty garbage bag. It makes great raincoat and waterproof shelter. You can also use it to collect rainwater.7. All purpose knife made of carbon-steel that can throw sparks when struck on granite. 8. A bottle of antibiotic ointment. 9. Some energy bars. 10. A whistle to draw attention, own camping equipments. Situated in the heart of South East Asia just north of the equator between latitudes 1 deg and 7 deg N and longitudes 100 deg and 119 deg E, is a country of extraordinary and fascinating wonders. It is basically divided into two landmasses – East and West Malaysia. West Malaysia, which is a peninsula of 131,587 sq kilometer in land area, shares its northern boundary with Thailand and is separated from Singapore at its southern end by the Johore Straits. East Malaysia, with a landmass of 198,847 sq kilometers, is located in the mystical island of Borneo. Malaysia is administratively divided into 13 states – 11 of which are in West Malaysia – with Kuala Lumpur as federal Capital. The states of Sarawak and Sabah make up East Malaysia. About 80% of Malaysia’s 22 million unique multi-racial population dwell in West Malaysia. Sarawak has population of about 21 million while Sabah has about 2.4 million. Bahasa Malaysia is the official language in this country, but English is widely used as a second language. With a landmass that lays claim to being the world’s 3rd largest island ( 743,812 sq km ), Borneo is surrounded by the Java Sea to south, the South China Sea to north and west, Sulu Sea and Celebes Sea to the East. The equator cuts approximately through the middle of the island, which is governed by three nations. The two Malaysian states of Sarawak and Sabah occupy almost the entire northwest coast while the oil-rich kingdom of Brunei Darussalam is straddled near the northern coastline. Sarawak, which is affectionately known as the “land of the Hornbills”, stretches about 700 km along the northwestern coast of Borneo covering a total area of 125,000 sq. km. This largest Malaysian state is home about 2 million people comprising more than 24 different races / indigenous groups who live harmoniously, celebrating their colorful cultural and religious festivals throughout the whole year. 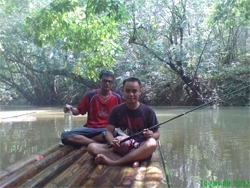 At present, about 68 percent of Sarawak’s land area is still covered by virgin jungles and forest. Viewed from the air, this states is a great expanse of undulating greens crisis-crossed by mountainous terrains and rivers, so many that they look like the veins of a leaf. Hidden among these towering greens are an abundance of flora and fauna. 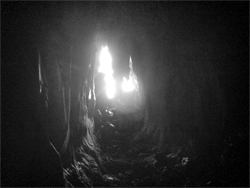 The world’s largest cave chamber and South East Asia’s longest cave passage are found at the Mulu National Park. Today, 9 national parks, 3-wildlife sanctuaries and 1-wildlife rehabilitation center have been gazette to protect and preserve these natural heritages. One of the most striking features of Sarawak is its natives’ longhouse. These elongated and stilted structures often built of axe-hewn timber, tied with creeper fibred and roofed with atap ( thatched leaves ) can house between 20 to 100 families under one roof. Bidayuh, The Bidayuh tribe are well known as a peace-loving and easygoing people, it was their gentleness that so enchanted the first White Rajah. They are also famous for their hospitality. The Bidayuh are reputed to be the best maker of tuak, or rice wine. But it was because of their mild disposition that the Bidayuh was dislodged by the influx of new tribes. The Bidayuh retreated from the lowlands to seek refuge in the mountainous areas, which were easier to defined. They built fortified longhouses, which led Europeans to call them “Land Dayaks” to distinguish them from the Iban – the “Sea Dayaks”. The Bidayuh’s meekness belies their head-hunting past. In their baruk, a roundhouse that rises about 1.5 meters off the ground, the Bidayuh store their skulls. The baruk also served as a gathering place for when the tribe was under attack.